settle this debate and declare one superior over the other (Rittle-Johnson, 1999, Gleman & Williams, 1997, Halford, 1993, Arslan, 2010). In terms of education, this research has greatly impacted teaching and learning approaches to math. In a report done by Barr, Doyle, Clifford, De Leo, Dubeau (2003) they pointed out teachers main complaints about student responses to mathematics (see table). "...focus needs to be on relationships between conceptual and procedural knowledge in math"
Star (2002) argues that instead of debating over superiority, education needs to consider the relationships that exist between these two approaches to math understanding. 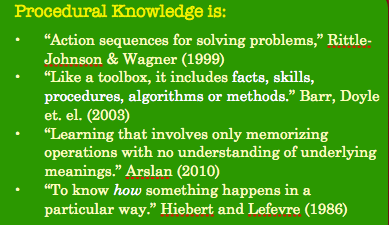 In Star's perspective, conceptual and procedural knowledge exist on a learning continuum and cannot be separated. With distinct differences between each pole of the continuum the aim of research should be to focus on how the relationships, connections, and intersections between these two approaches impact and deepen student learning. Barr, Doyle et. al. (2003) point out that when we ask students to perform a procedure such as solving an equation, students can often follow an example and get a correct answer without understanding how or why the process works. Traditionally, the majority of assessment in math learning has been based on students' abilities to manipulate knowledge in a procedural format. Tests, exams and quizzes aimed at students producing correct answers highlight their abilities to show how the math processes work, but do not shed light on the deeper meaning of why. In Star’s opinion student C demonstrates both a conceptual and procedural understanding of the problem. They can see math understanding as infinate and complex. He points out that too often the majority of math instruction concentrates on stage 3 (Computation) and does not focus on teaching students how to develop math thinking that relates to being able to pose relevant meaningful questions of ideas that exist outside the classroom. Wolfram notes that in today's global society, careers that use math more often than not rely on computers to do computational tasks (stage 3) and individual creativity and understanding of complexities of math are then responsible for stages 1, 2, and 4. Rittle-Johnson, B., & Alibali, M. W. (1999). Conceptual and procedural knowledge of mathematics: Does one lead to the other? Journal of Educational Psychology, 91(1), 175-189. Star, J. R. (2002). Re-conceptualizing procedural knowledge: The emergence of “intelligent” performances among equation solvers. In D. Mewborn, P. Sztajn, D. White, H. Wiegel, R. Bryant, & K. Nooney (Eds. ), Proceedings of the 28th Annual Meeting of the North American Chapter of the International Group for the Psychology of Mathematics Education (pp. 999-1007). Columbus, OH: ERIC Clearinghouse for Science, Mathematics, and Environmental Education.